Fabulous addition to our wedding reception. Everything was first class - the trailer was no ordinary restroom. Never thought I would describe the trailer as elegant and refined, but it was gorgeous. Every detail was considered, even the love-themed pictures and flowers in each his/her side. I highly recommend. I would highly recommend the luxury restroom trailer! The sales team was super flexible and had it dropped off for our rehearsal dinner 2 days early! I loved how clean the restrooms were and having an attendant on-site was great for restocking, etc. I got so many compliments on this, lol! Would definitely rent from them again! They were seriously awesome! Our wedding guests were so impressed with how nice and clean the restrooms were and they provided an amazing ambiance with music and great lighting! We got married a few months ago and people are still talking about how awesome the restrooms were. Thank you so much for going above and beyond! The restroom trailer was very affordable, clean and decorated nicely for our wedding. The staff was very prompt in responding to calls and emails. I highly recommend their services for anyone needed a restroom trailer for their events. The service was great! I would highly recommend to a friend. Restroom setup was quick and easy even after booking it last minute for our wedding. The guys thathat set up the trailer went above and beyond to make sure I was happy with the look and location. The bathrooms are kept well maintained and even come heated! All the guests commented on how nice they were. I would highly recommend using this service! 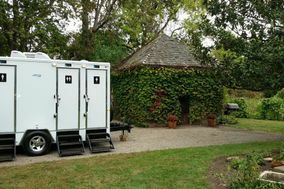 Wonderful people to work with, the restroom trailer was a great item to have for an outside wedding reception! The ladies were so pleased to find out that the restrooms were as an in home restroom. Beautifully decorated for the occasion as well. I will definitely use them again!!! It also came with an attendant that took great care of everything during the event! Included in price!!! Wonderful people to work with !!! I say I would call them friends. Bullitt Septic was awesome to work with! Very professional! We highly recommend Bullitt Septic and would love to have back to Stone's Throw Farm often! Everyone was awesome to work with. Restrooms were very, very nice. They were the talk of the night!! thanks Brad and crew. Well worth the money. Very very nice and clean; ALL NIGHT LONG! Employee there to keep watch! We were amazed at how nice and luxury Bullitt Septics commercial restroom trailers were! They were most definitely top of the line units. People were raving at our event about at how nice they were. Brad and Susan were so great to work with, we will absolutely be using them in the future and recommending them for all of our events. Many guests commented on how nice the restroom trailer was. It was an unexpected compliment to get! Clean, beautiful, AC restrooms on a hot day, Priceless!!!! This was a great service. No more "regular" port-a-potties for me. Everyone at the wedding loved the bathrooms. I especially appreciated how much external lighting there was on the trailer for after dark. Great facility, great crew.